Honey-bees construct wax combs inside their nests. The combs are made of hexagonal prisms – cells – built back to back, and are used to store honey, nectar, and pollen, and to provide a nursery for bee larvae. The combs are natural engineering marvels, using the least possible amount of wax to provide the greatest amount of storage space, with the greatest possible structural stability. Darwin recognised that explaining the evolution of the honey-bee’s comb-building abilities was essential if his theory of natural selection was to be taken seriously, and in the 1850s he carried out his own experiments at his home at Down House in Kent, and wrote many letters on the subject. For natural theologians, who looked on nature as showing the workings of providence, the bee cell was a favourite subject. The question of how little insects could solve correctly a design problem that challenged even expert human geometers, and implement it practically, pointed, they thought, to a governing intelligence. In Lord Brougham’s Dissertations on subjects connected with natural theology (1839), Brougham commented that bees acted with a discipline that in men could only be effected by a superintendent with a design. The bee chose the most advantageous shape for her cells, he wrote, ‘as indeed we might well suppose when we recollect who is her teacher’ (Brougham 1839, 1: 35, 77). William Kirby wrote of the bees as ‘those Heaven-instructed mathematicians, who before any geometer could calculate under what form a cell would occupy the least space without diminishing its capacity, and before any chemist existed to discover how wax might be elaborated from vegetable sweets, instructed by the Fountain of Wisdom, had built their hexagonal cells of that pure material, had closed them at the bottom with three rhomboidal pieces, and were enabled, without study, so to construct the opposite story of combs, that each of these rhomboids should form one of those of three opposed cells, thus giving strength to the structure, that in no other place, could have been given to it’ (Kirby 1852, 2: 246). Darwin’s copy of Brougham’s Dissertations is heavily annotated. He recognised that the problem of the bee cell was important for his theory. On page 77, he scribbled, ‘very wonderful – it is as wonderful in the mind as certain adaptations in the body – the eye for instance, if my theory explains one it may explain other.’ Darwin, and others working on naturalistic explanations, needed to show how bee cells could arise from simple processes. The theory of evolution by natural selection was supposed to be a comprehensive theory of life on earth: if it could not explain bee cells, it was radically flawed. Darwin needed to show two things: first, how the bees’ abilities had evolved over time, and second, how the bees built their combs using only the instincts and intelligence they had evolved. The first point was relatively straightforward. Brougham, rejecting the suggestion that hexagonal cells could have arisen from cylindrical cells, asserted that no bee in the world ever made cylindrical cells (Brougham 1839, 1: 32). However, Darwin knew that humble bees made roughly cylindrical or near spherical cells for holding honey and larvae, and was delighted to discover a Mexican bee, Melipona domestica, that made a rough comb of cylindrical or nearly spherical cells, with flat sides where cells happened to meet. Most naturalists accepted that circular structures were the easiest for animals to construct: for example, birds’ nests are usually circular. Darwin argued that if the Melipona put its cells together in a more regular fashion, it would probably develop a structure like that of the honey-bee (Origin, p. 226). Further, there were advantages to a more regular, hexagonal-celled, structure: it used less wax to store more honey. Thus, when under environmental pressure (cold winters, lack of food), bee colonies with the more efficient structure would be more likely to survive and prosper. Bees can make apparently true cylinders & spheres. (2) They never begin one cell at time always several (3) they can judge distance to certain extent, & (4) those that make their spheres or cylinders so that if completed, would intersect make an intermediate flat wall. Then assume perfect judge of distance, I thought that all angles might follow, for I cd see they would in hexagonal prism.–— My notion modification of Waterhouses. Ld. Brougham sneers at it. Meanwhile, Waterhouse was still exercising his mind on the subjects of wasp’s nests. He sent another long letter to Darwin on the subject, this time arguing that where the sides of wasp cells that were not bounded by other cells were straight, this was because of the cues taken by the wasps from the other straight sides that were bounded by other cells (letter from G. R. Waterhouse, 17 April 1858). Some discussion having arisen relating to the construction of the cells of the hive bee, Mr. Waterhouse stated that he was of opinion that the hexagonal form of cell was accidental, so far as the constructors of the cell were concerned; and having been called upon to explain his views, he proceeded, in the first place, to call attention to the fact that if a number of cylinders of equal size were packed close together, side by side, each cylinder would be surrounded by six others; that, assuming the cylindrical form (or at least a form of cell approaching more or less to the cylindrical, and having a circular section) was the type form of isolated cells constructed by different kinds of bees, and that, in the case of the hive bee, a number of insects worked together, first depositing a small portion of wax, then excavating a small circular cavity in the same, for the commencement of a cell; this then being followed by the deposition of more wax and the excavation of more cavities, and these being placed close to the first; then neither of the cells could be constructed of their natural diameter, provided the first cavity formed had not attained the full diameter of the complete cell. The diameters of the cells would intersect each other; but if partitions be left between them, the cell must be six-sided, if the cells remain equal in size. In order to make the idea more clear, he . . . would assume for a moment that it were a law that a number of equal-sized circles, being packed closely together, side by side, and that each circle was then surrounded by seven others; he believed that the cell of the hive bee would, in that case, have been seven-sided. Such were the views entertained many years back by Mr. W., and published by him in the ‘Penny Cyclopaedia;’ and having subsequently had his attention particularly directed to the subject, whilst examining the nests of a vast number of Hymenopterous insects, he still believes those views to be essentially correct. He now, however, has reason to believe that it is not absolutely necessary for the supposed natural diameters of the cells to intersect before an angular-formed cell would be produced. The instinct which leads an insect to excavate, in order to form a cell, may lead it to excavate beyond what would be necessary to form a sufficiently large cell, in the case of an insect, which, under ordinary circumstances, burrows until it comes in contact with an adjoining cell. Contact with other cells was the essential condition which influenced the angular form of any particular cell. . . . Mr. Waterhouse said he had possessed a very small nest of a hornet which consisted of three cells only; it was built in a small cavity adjoining a large nest, and where there was not room for more than three cells; they were circular externally and angular internally,–—that is to say, each cell had two straight sides where it came in contact with two other cells, and was rounded elsewhere. Mr. Tegetmeier remarked that he possessed a small piece of honey-comb which presented the same peculiarities. Darwin quickly arranged to look at Tegetmeier’s piece of honeycomb (letter to W. B. Tegetmeier, [21 April 1858]); however, it had been mislaid. Nevertheless, Darwin asked Tegetmeier to keep an eye out for the first beginnings of the comb (letter to W. B. Tegetmeier, 9 May ). He suspected that the first cells, built without the constraints of neighbouring cells, would not be hexagonal. Darwin was probably particularly concerned about the pentagonal cell wall that is constructed out of the original curved arch, since Huber’s diagrams show this transition clearly. Darwin thought that the arch was not made angular until the hexagonal cells of the second row had been begun by the bees making further hemispherical scrapes. However, he may also have been concerned about the angular bottoms of the cells that were excavated out of the original hemispherical scrapes. The bottom of a hexagonal cell is a pyramidal structure that fits neatly against the bottoms of three cells on the other side of the wall. Darwin thought that this angular structure too was only formed as a result of the presence of other cells. Darwin tried three different experiments with bees’ cells at Down that he reported in Origin. In one, he put a thick block of wax into the hive. ‘The bees instantly began to excavate minute circular pits in it: and as they deepened these little pits, they made them wider and wider until they were converted into shallow basins, appearing to the eye perfectly true or parts of a sphere, and of about the diameter of a cell. It was most interesting to me to observe that wherever several bees had begun to excavate these basins near together, they had begun their work at such a distance from each other, that by the time the basins had acquired the above stated width (i.e. about the width of an ordinary cell), and were in depth about one sixth of the diameter of the sphere of which they formed a part, the rims of the basins intersected or broke into each other. As soon as this occurred, the bees ceased to excavate, and began to build up flat walls of wax on the lines of intersection between the basins, so that each hexagonal prism was built upon the festooned edge of a smooth basin, instead of on the straight edges of a three-sided pyramid as in the case of ordinary cells.’ (Origin, p. 223.) The cells were built up in a hexagonal shape when their bases intersected with those of other cells; but the pyramidal bases were apparently not built, since there was no pressure to accomodate cells on the other side of the wax, which was a thick block. These experiments were repeated in 2009 by John Williams, a master beekeeper who maintains an observation hive at Down House during the summer. In these photographs, it is possible to see how the bees tended to clump their cells and build them up into hexagons; but the circular foundations of seven adjacent unfinished cells are also visible in the second photograph next to the left-hand clump of cells. Secondly, Darwin put a thin piece of vermilion wax in the hive, a ‘narrow, knife-edged ridge’. In other words, by starting their excavations in the correct places, the bees produced an approximation to the pyramidal bottoms of cells simply by ceasing to excavate when they were about to break through into another cell. In his third experiment, Darwin covered edges of the walls of a hexagonal cell, or the extreme margin of a growing comb – the place in which the cells are furthest from hexagonal – with a thin layer of vermilion wax. ‘I invariably found that the colour was most delicately diffused by the bees . . . by atoms of the coloured wax having been taken from the spot on which it had been placed, and worked into the growing edges of cells all around’ (Origin, p. 232). The bees were continually rebuilding unsatisfactory cells as the comb grew outwards. The experiments with vermilion wax have also been repeated by John Williams. A ‘knife-edge’ ridge of wax is sometimes applied to the top bar of a hive to encourage the bees to build in the right place, and it is likely that the ‘knife-edged ridge’ used by Darwin was a similar arrangement. The results of this experiment show something that Darwin does not mention, but that beekeepers would no doubt take for granted: the bees add their own wax to the vermilion wax as they work to extend it. The vermilion (as Darwin found in his third experiment) becomes thoroughly mixed with uncoloured beeswax over most of the resulting comb. This is now an on-going experiment and can be seen in the observation hive at Down House during the summer. The result is shown in the photograph below. In August 1858, Waterhouse’s remarks at the 5 April meeting of the Entomological Society (see extended quotation, above) were reprinted in theZoologist. He no doubt began to regret the wording of his suggestion that hexagonal cells were a necessary consequence of packing cylinders in a small space, as some readers may have understood him to mean that the hexagons were formed as a result of lateral pressure on the comb, a theory that had been current and that had been dismissed by Lord Brougham. At a meeting of the Entomological Society on 7 July 1858 (Proceedings of the Entomological Society of London n.s. 5 (1858–61): 34–5), the issue was discussed. John Edward Gray, the president, using vermicelli as an analogy, supported the idea that compressed cylinders became hexagonal prisms, and added, with characteristic acerbity, that he ‘considered the attempt made by Natural Theologians to prove that the formation of an hexagonal rather than a cylindrical cell indicated the possession of a greater degree of Divine wisdom bestowed on the insect, was the greatest piece of humbug they had ever brought forward.’ Frederick Smith however had apparently made paper cylinders and failed to compress them into hexagons. Waterhouse reviewed the latest controversies in his letter to Darwin of 2 August 1858. The notion that the theory of hexagonal bee cells being formed from cylinders depended on actual physical compression was to dog responses to Darwin’s own theory as well. Also in August Darwin received a hive from Jamaica, and observed that the cells were larger than those made by European bees. He at once sent for specimens of the actual bees, probably curious to see whether the size of the cell was proportionate to the size of the bee. This would suggest that the famous regularity of bee cell sizes might have a simple explanation. (Letter to Richard Hill, 8 August .) Much later, Jeffries Wyman wrote to Darwin from Cambridge, Massachusetts, that he found that bee cells were not as regular as some had supposed them to be; their measurements varied, the pyramidal bases of the cells sometimes had four, not three rhombs, and the transition from worker to drone cells (these are different sizes) was carried out in different ways (letter from Jeffries Wyman, 11 January 1866). In Origin, in November 1859, Darwin published a theory of cell-building that differed from both Huber’s and Waterhouse’s. 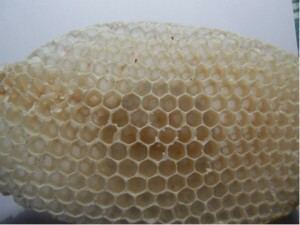 Huber had believed that although the bees began by making curved arches in the wax partly following the outline of the first hemispherical depressions that they dug into the wall of wax, these were swiftly converted into angular (pentagonal) structures and followed in the second row by hexagonal structures. Waterhouse believed that the bee built the cells up in circles, and that when the circle of one bee threatened to break into the circle of another, they both stopped excavating at the nearest point and switched their attention to excavating the wax where there was no imminent danger of breaking through, thus making hexagons. Darwin, however, had observed that the bees began by making hemispherical scrapes in the wax, and that where the scrapes intersected, they built or excavated straight walls, thus building up hexagonal prisms. Cells at the edge of the comb tended to have roughly curved walls until further cells were built and they were transformed into more regular hexagons. Thus, in Origin, Darwin explained the development of the honey-bee’s cell-building instinct from simpler forms (the less organised, round cells of other insects), and explained their method of building based on the repetition of simple actions and feedback from simple sensations, rather than on the application of geometry. His observations, and those of Tegetmeier and others, had proved that bees did not build angular structures except at the intersections between cells; that they continually rebuilt the roughly finished cells at the margins of the comb into more regular structures as the comb grew outwards; that there were measurable advantages to the regular structures of the honey-bee over the more haphazard structures of other bees in times of scarcity; and that the unfailing regularity and precision of the bee cell was, when precise measurement was bought to bear, a myth. In 1865, Darwin received a letter from Edward Cresy (letter from Edward Cresy, 10 September 1865), in which Cresy sent as an illustration of Darwin’s bee-cell theory a description of a plum pie, the crust of which came out of the oven ‘completely mapped out with hexagonal articulations’. ‘By guesswork each plumb should have punched just a swelling & then a round hole for itself like a round shot through a plank but I suppose the strain came to equally on all part of the crust so the spherical plumbs laid the foundation, without any instinctive knowledge of a series of regular hexagonal combs’, Cresy concluded: the plums didn’t need to know how to do it any more than the bees did. Has found no reference to construction of bees’ cells in works referred to by CD. Describes cell ofOsmia atricapilla. Hive-bees’ cell was described at Entomological Society. Bees’ cells. Observations onOsmia atricapilla. GRW’s observations of and ideas on bees’ and wasps’ cells. A set of questions CD prepared for his meeting with WHM to discuss the geometry of bees’ cells. Bees’ cells; GRW thinks hexagonal shape is accidental. Encloses notes on cells ofIcaria. "Excessively" interested in theory of bees’ cell formation. Fears few of his pigeons will be of any use to WBT. Hopes WBT will describe foreign poultry breeds. Inquires about the structure and formation of bees’ comb; is interested in seeing its form at the commencement of building. Has come to heavy grief about bees’ cells, unless Huber is wrong [François Huber,New observations on the natural history of bees, new ed. (1841)]. Discusses cart-horses and stripes on a Belgiman [Belgian?]. Hopes to begin pigeon MS in a week. Has lately been working on bees’ cells and wishes very much to examine a cylindrical one. Discusses bees’ cells. Wants hive and swarm; would be glad to have WBT’s box with commenced cells. "I am partly a disciple of Waterhouse, but not wholly." Bees’ cells; is the hexagonal shape deliberate or merely the result of lateral pressure on cylinders? Has finished with and is disposing of his pigeons. Invites WBT to Down; would like to see his bees’ cells. Reading Carl Vogt [Lectures on man(1864)]. Vogt, though anti-Lamarck, is converted to Darwinism. Has made observations on bees’ cells. Their dimensions are not constant, nor do single bees make single cells; each one is a result of co-operation. With grateful acknowledgments to John Williams, Gene Kritsky, and Randal Keynes for their generous assistance and patience. Brougham, Henry Peter. 1839.Dissertations on subjects of science connected with natural theology: being the concluding volumes of the new edition of Paley’s work. 2 vols. London: C. Knight. Brougham, Henry Peter. 1858. Recherches analytiques et expérimentales sur les alvéoles des abeilles. Comptes Rendus Hebdomadaires des Séances de l’Académie des Sciences 46: 1024–9. Darwin, Charles. 1859. On the origin of species by means of natural selection or the preservation of favoured races in the struggle for life. London: John Murray. Davis, Sarah. 2004. Darwin, Tegetmeier and the bees. Studies in History and Philosophy of Biological and Biomedical Sciences35: 65–92. Huber, François. 1841. New observations on the natural history of bees. Translated from the original French. London: Thomas Tegg. Huber, François. 1814. Nouvelles observations sur les abeilles. 2d edition. 2 vols. Paris and Geneva: J. J. Paschoud. Kirby, William. 1852. On the power, wisdom, and goodness of God : as manifested in the creation of animals, and in their history, habits, and instincts. New edition, edited by Thomas Rymer Jones. 2 vols. London: Henry G. Bohn. Kritsky, Gene. The quest for the perfect hive. Oxford: Oxford University Press. Forthcoming. Seeley, Thomas D. 1985.Honeybee ecology. A study of adaptation in social life. Princeton: Princeton University Press. [Waterhouse, George Robert.] 1835. Bee. In The penny cyclopaedia of the Society for the Diffusion of Useful Knowledge, edited by Charles Knight, vol. 4, pp. 149–56. London: Charles Knight. Williams, John. 2009. Darwin’s bees. The Central Association of Bee-Keepers. Winston, Mark L. 1987. The biology of the honey bee. Cambridge, Mass., and London: Harvard University Press.